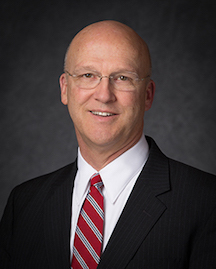 Weatherford T. Clayton is a General Authority Seventy of The Church of Jesus Christ of Latter-day Saints. He was sustained on April 2, 2016. He was serving as president of the Canada Toronto Mission at the time of his call. Clayton was born on March 1, 1952, in Los Angeles, California. He studied at Brigham Young University for one year. After completing his full-time missionary service in the French Canadian Mission, he earned both his bachelor’s degree in psychology and his medical degree from the University of Utah. He was an obstetrician gynecologist in private practice from 1985 to 2013. He worked as a laborist from 2013 until 2014 when he retired. He has served in the Church as ward mission leader, bishop, stake president, family history consultant, gospel doctrine teacher, and Young Men president. Clayton and his wife, Lisa, are the parents of five children. He is a brother to L. Whitney Clayton, currently serving in the Presidency of the Seventy. He is a descendant of pioneer William Clayton. This page was last edited on 9 October 2016, at 23:49.